He’s had a rough 8th month. He’s been sick twice and had a bad cold this week (that he got from mom and passed on to me and then to Kelly) which made it hard for him to breathe with his thumb in his mouth. That made it hard for him to sleep at night so we had a few sleep-deprived nights this week. The bulb syringe was used frequently to unblock his nose — it’s amazing how much stuff can come out of such a tiny nose. He’s babbling a lot more than he used to and seems to be trying hard to talk. Still nowhere near walking and doesn’t try crawling very much even though he doesn’t like to stay in the same place or position for long. He’s becoming a very picky eater too, one day he’ll love something and the next he will refuse to eat it. He’s starting to eat solids but that’s hit and miss too. 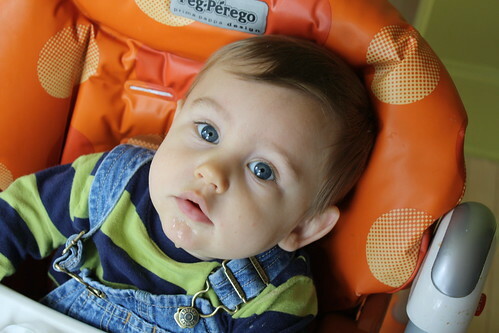 Hudson at “7 months”:https://troyandgay.com/blog/2009/03/25/hudsons-7-months-old/, “6 months”:https://troyandgay.com/blog/2009/02/25/hudsons-half-birthday/, “5 months”:https://troyandgay.com/blog/2009/01/25/hudson-at-5-months/, “4 months”:https://troyandgay.com/blog/2008/12/25/hudsons-4-months-old/, “3 months”:https://troyandgay.com/blog/2008/11/25/hudson-is-3-months-old/, “2 months”:https://troyandgay.com/blog/2008/10/25/hudsons-two-months-old/ and “1 month”:https://troyandgay.com/blog/2008/09/25/hudson-at-1-month/. Sounds very similar to the experience we have had with Kavan this month, except the cold.